Did you all have a fab Mother's Day on Sunday? I didn't get to brunch with mom as she lives on the other side of the country, but she did get a C. Wonder gift from me. But let's talk about the look. If you read musings of a muse: part 4 then you know that I had plans to update these wisteria shorts in a new spring outfit. I remembered I had this awesomely unique double pattern blouse that would go perfectly. And I must say, I am pleased. Adding my favorite blazer definitely completes the look. Or maybe that honor goes to these fun Jason Wu Melissa shoes. This is my first pair of Melissa shoes. I wasn't sure I would like them at first because they're so different from the shoes I already own. But they're actually a lot of fun. The grosgrain bow applique is the best part. They add a little something extra to the typical pair of flats. And I love wearing flats, y'all. I'm all about comfort and style. 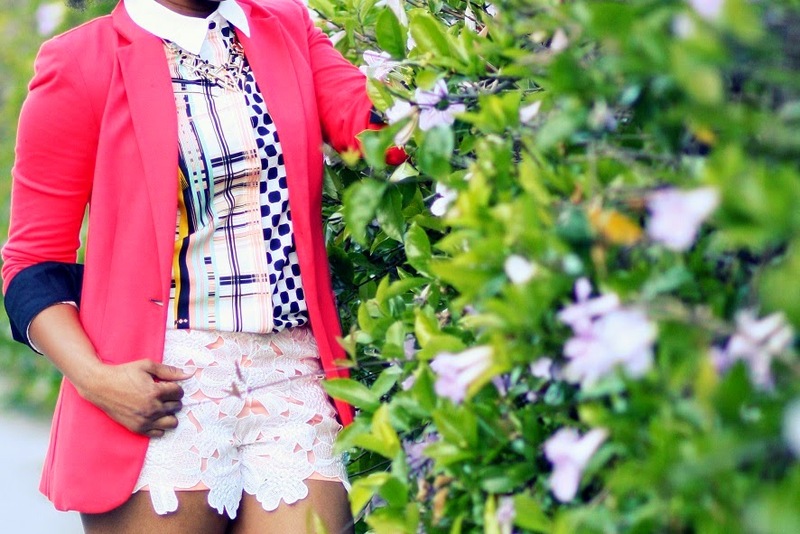 See how I've worn this Target Mossimo blazer on the Muse. Clearly, I like to wear it with collared shirts. And if you didn't think so before, it's obvious that pink and blue are a great color combination: my style tip of the season. I love those shoes - they're really cute and look great with this! 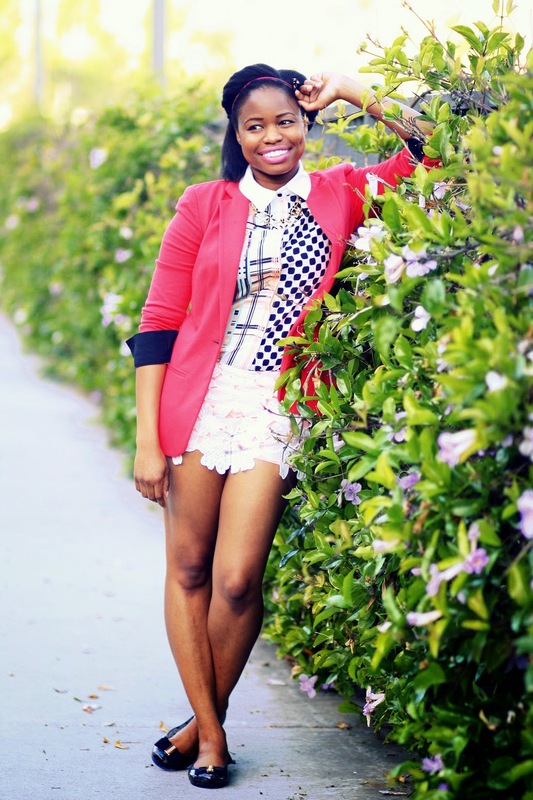 Cute pattern mixing with the blouse and can't go wrong with a cute red blazer! I love the re-style! These shorts are so cute and they deserve to be shown off! Great look! Love that blazer and yes to pink and blue. I really like those shorts, they are super gorgeous as well as that necklace! Such cute shorts. The whole look is perfect! Hey beautiful lady! 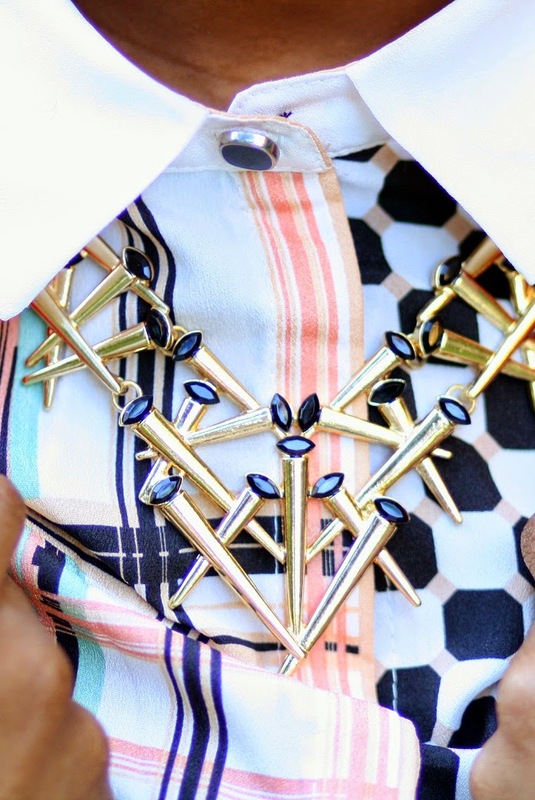 Love the details of your outfit. And all the cool transformations of you in that pretty pink blazer! 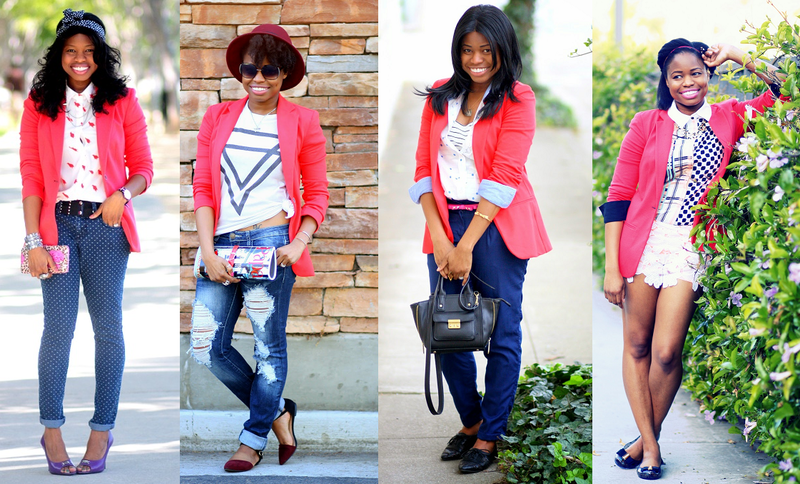 Love seeing how many different ways you styled the blazer! I need to do this with my own outfit photos! Those Melissa shoes are pretty rad, Cheryl:) And that blazer is such a great buy. You can wear it so many ways, eh? What a great look! 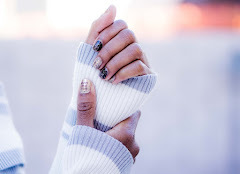 I love the mix of patterns and texture, so pretty! Love the colors too, perfect for spring/summer. that necklace that necklace necklace!! And yes everything else too, but oh that necklace! Those lace shorts are the cutest! Great look lady! You shorts are so cute! I'm loving that necklace as well! You look darling! Love your colorful outfit with all the graphic prints! Love the different ways you've styled the blazer, great find! I think this look is FABULOUS! I really love your style, and enjoyed how you styled the blazer in each look. Oh yea, that necklace is amazing! Very cute. Love the blazer, that was a great buy for, so versatile. Ohh your lace shorts are so cute! I love all the ways you've remixed this blazer as well. What a closet staple! i love the mix of prints and texture in this look. i've been curious about melissa shoes - i had jelly shoes as a kid! Those shorts are adorable! Super cute style. I love your hair here!! The little twist is adorable! 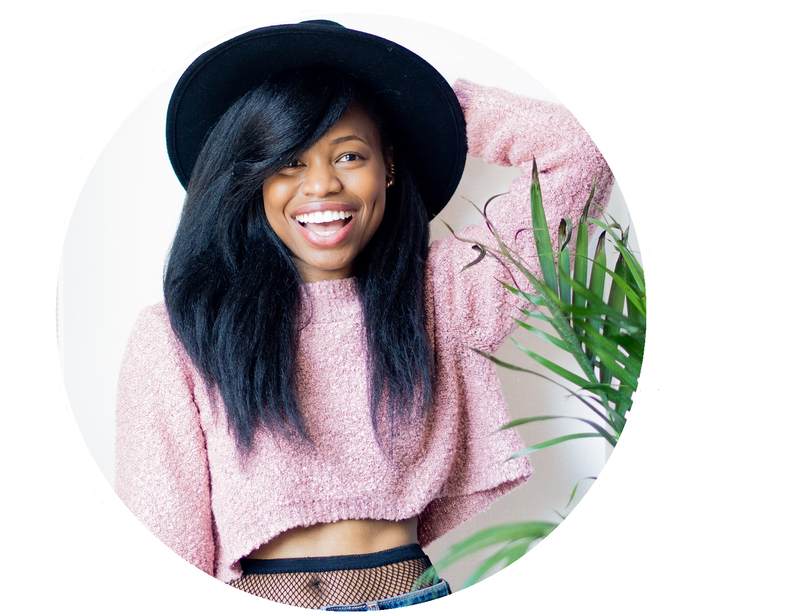 I love that you have found so many ways to style your blazer. I need to find a colorful one, I only have a black blazer.